This post aims to give you all the information you need to choose between the Garmin Edge 1030 vs 820 vs the brand new Edge 520 Plus. First there is a chart that highlights the key differences. Then I discuss those differences. Then I offer some advice on which Garmin Edge to buy, based on your needs. Finally, I present a chart comparing all of the key features of all 3 bike computers, for those who want to know every single detail. 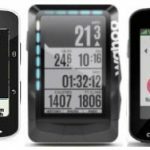 If you don’t have enough time to read all of this, you can jump to the Bottom Line on which Garmin Edge bike computer is right for you. Otherwise, please read on! 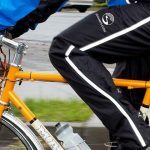 If you find this review useful and decide to buy one of these bike computers, please consider using one of our affiliate links to buy. It’s the only way I can get paid for the many hours of research and writing I do, and of course, it costs you nothing – so it’s a win/win! When you buy with one of our links, you support Maggie and me to keep on being bloggers and publishing this blog (thank you!). At the end of this post, I offer reputable online buying options. Click here for buying options. First off, here is a chart that highlights the differences between these three bike computers. Check the price on Amazon Right Now: Because price is lower than manufacturer's recommended price, we cannot display it. Please click here for current price. $399.99 (Price for bundle with speed and cadence sensors) Because price is lower than manufacturer's recommended price, we cannot display it. Please click here for current price. As you can see, there are several differences between these three premium GPS bike computers. Also, the Edge 1030 looks quite different from the other two. The Edge 820 and 520 Plus are the same size and weigh almost exactly the same. They look like big, beautiful bike computers. The Edge 1030 is even bigger, and looks more like a smart phone. All three have the sleek good looks and quality feel that comes with all Garmin bike computers these days. Below is a visual of the differences between these 3 Garmin Edge bike computers. 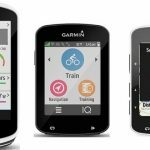 So How to Decide: Garmin Edge 1030 vs 820 vs 520 Plus? All 3 are top-quality bike computers that offer a dazzling number of advanced bike training features. You can connect all 3 to a range of useful devices and sensors, such as heart rate monitors, and speed, power, and cadence meters. They all have access to both GPS and Glonass satellite systems, so they acquire a GPS signal fast. All 3 will record your bike rides and will wirelessly transfer your data to Garmin Connect (or Strava, or several other apps). All 3 offer advanced performance and power analysis, including Time in Zone, FTP (Functional Threshold Power) tracking, cycling-specific VO2 and recovery and cycling dynamics. 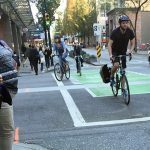 (See chart at the end of this post for all of the features that you get with these bike computers.) All 3 offer live tracking – which means designated people can track where you are. All 3 are very connected, with phone call and text message alerts, and a ton of other connected features. All 3 have beautiful color screens. But … the prices are very different! To simplify matters, I have summed up the 3 bike computers below. The Garmin Edge 520 Plus is an upgrade on the Garmin Edge 520. The Edge 520 itself was widely hailed as the biggest leap forward in bike computers ever, when it was launched in July 2015. Since then it has proven extremely popular. But now, Garmin has improved even further on this stellar little bike computer. To my mind, it seems that with the Edge 520 Plus, Garmin is responding aggressively to increasing competition from the likes of Wahoo. Is the Edge 520 Plus enough to fight off the competition? Yes, I believe that with this upgrade, Garmin now has the edge in bike computing power at this level (forgive the pun – I found it irresistible!). Like the 520, the Garmin Edge 520 Plus has button control, not touch screen control (as found in the Edge 820 and Edge 1030). Personally, I prefer button control. Sometimes I find screen swiping doesn’t work perfectly, especially in the rain (however, the new Garmin Edge 1030 has pretty much solved that rain-on-screen problem). Button control gives you complete control, all the time, even with gloves on. On the other hand, many people prefer touchscreen control. Some people find they have become so used to touchscreen controls on their phone that it has become intuitive. If this is you, you may find that not having touchscreen control is annoying. So, what is so different about the Edge 520 Plus vs the 520? Well, the Edge 520 did not give you cycling-specific maps and could not calculate routes of any kind for you; plus, it could not give you turn-by-turn directions as you cycled. For those premium features, you needed to look at the Edge 820 or Edge 1030. All you got with the Edge 520 were the most basic of maps, plus breadcrumbs-type navigation if you downloaded courses to it. The Edge 520 Plus comes preloaded with Garmin Cycle Maps for your region, so it can navigate along a saved course, or to a saved point (such as your office or your home, or the local pub), without an internet connection. With this kind of navigation, you get turn-by-turn directions and alerts for sharp turns ahead. After you follow a route, the Edge 520 Plus can guide you back to the start. The Edge 520 Plus has the Trendline Popularity feature, which highlights routes that other cyclists prefer. 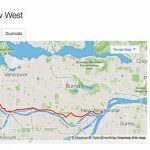 This has the major advantage that you are shown routes that are actually fun or safe to bike, rather than simply the shortest route. You can use the preloaded Yelp app to find nearby bike shops, coffee shops, etc. – and navigate to them with turn-by-turn directions. You cannot find nearby POIs (Points of Interest) and navigate to them (only the Edge 820 and 1030 can do this). However, the Yelp app does almost exactly the same thing. You cannot search for an address and ask the Edge 520 Plus to navigate to that address (only the Edge 820 and 1030 can do this). Basically this means you need to plan ahead, and download new routes to your Edge 520 Plus before you set off on your bike. For many cyclists this is not a deal-breaker … but for some, it is. 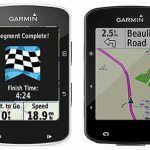 This is probably the most important aspect to consider when deciding if the Garmin Edge 520 Plus is for you – if this feature does not matter to you, then it is hard to see how you could wrong with the new Garmin Edge 520 Plus. If it does matter … consider the 820 or the 1030. In a nutshell, the Garmin Edge 520 Plus will suffice for the navigation needs of all but the most demanding cyclists. To me it looks like the best bang-for-your-buck, premium bike computer on the market today, and it has been rated by BikeRadar as the “best GPS cycling computer on the market for performance-minded riders”. This one is for you if you want absolutely premium bike training features in a small, light, affordable package, and you like the convenience of turn-by-turn directions, but you do not need your bike computer to calculate routes on the fly for you. Plus, you are more into button control than touchscreen control. The Garmin Edge 820 was a massive upgrade on the Edge 810, and arrived with brand new features that had not previously been seen in Garmin Edge bike computers. These included Group Track, Incident Alert, Battery Save Mode and Stress Score. It was also rolled out with compatibility with Connect IQ from the start. Of course, the Edge 520 Plus now has almost all of those features (except for Battery Save Mode), and the Edge 1030 shipped with all of them – and then some. Of course, the Garmin Edge 820 has true turn-by-turn navigation built into it, right out of the box. So does the Edge 1030; the Edge 520 Plus has less advanced navigation features and can only do turn-by-turn navigation in certain circumstances. The Garmin Edge 820 offers a huge number of features, including advanced training options, great maps and turn-by-turn navigation, as well as connectivity with every possible sensor, and smart notifications. The Garmin Edge 820 is excellent for both bike training and figuring out routes, much like a car GPS. You can read a complete review of the Garmin Edge 820 here. 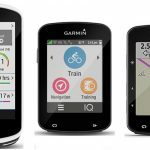 In a nutshell, the Garmin Edge 820 is for you if you want absolutely premium bike training features in a small, light, package, and you also want premium mapping and navigation features, plus connectivity with every possible sensor, smart notifications, and the latest apps. Plus, you prefer touchscreen control over buttons. The Garmin Edge 1030 offers a dazzling array of features, plus great user friendliness. If you need high-end training metrics and high-end maps and navigation, connectivity with every possible sensor, and smart notifications, then the Garmin Edge Bike Computer 1030 may be the right bike computer for you. Also, the big innovation with the Edge 1030 is the improved battery life – you can read more about that further down in this post. The Edge 1030 also has the largest screen of any bike computer. This makes it great for seeing maps with ageing eyes. It is actually half an inch taller than the Edge 1000, which was previously the biggest bike computer. A bigger screen is not only easier to read, but also a bigger screen makes it that much easier to work the touch screen controls (something I personally find quite important when riding a bike in the rain). Finally, the Edge 1030 has somehow managed to greatly improve touch screen control in the rain – something which some users complained about with the Edge 820. Naturally, as with the Garmin Edge 820, the Edge 1030 has true turn-by-turn navigation built into it, right out of the box. Next I have more details on the major differences between the Garmin Edge 1030, 820, and 520 Plus. Do You Need Tons of Battery Power? Probably the most important advantage the Edge 1030 has, it its the vastly improved battery power. It has a claimed battery strength of 20 hours, as opposed to the 15 hours of the Edge 520 and 820. PLUS, it also has Garmin Charge, which adds 24 hours to battery life. This is basically an external battery pack that clamps onto the bottom of the Garmin out front mount, and seamlessly and automatically connects with the Edge 1030. This is an optional extra – it does not ship with the basic unit. I have not been able to cycle for a continuous 44 hours to test this battery life … and I am quite sure I never will achieve that in this particular life time. However, I have always found Garmin battery claims to be quite reliable. Plus, the Edge 1030 has Bluetooth Smart, which is a low-energy way to connect wirelessly to your smartphone and upload data, and so use less battery power. Also, both the Edge 1030 and the 820 have battery save mode. You engage this if you are worried about running out of battery power. The screen will blank out, but it will keep recording your ride. You can bring the screen back to life at any time. This extends the battery life by several hours, and helps keep the 820 competitive with the 1030. 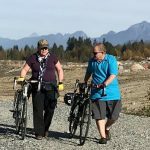 If you need a bike computer that you can use for navigation as it will calculate routes and give you turn-by-turn directions, then you need to carefully compare the Edge 520 Plus with the other two options. Only the Edge 1030 and 820 come with the advanced navigation feature of being able to input an address on the fly, and then have the unit navigate there while giving you turn-by-turn directions. The Edge 520 Plus cannot figure out how to get to places on the fly. However, it is a big improvement on the Edge 520, as detailed fully above. As long as you don’t mind thinking about your cycling plans beforehand, you can download any route you like to the Edge 520 Plus, and get your turn-by-turn directions when you do the ride. And of course, it can navigate to saved places, and to places on the Yelp app. The Edge 1030 and 820 both have touchscreen controls, while the Edge 520 Plus is operated with buttons. So your preference on this matter is important. Bear in mind that there have been some user complaints about touchscreen controls on the Edge 820 in the rain. However, the Edge 1030 has vastly improved in this respect, and performs really well in the rain. It is still hard to operate when wearing bulky cycling gloves, however. To completely avoid touchscreen problems, you may choose to opt for the 520 Plus. There are minor differences in the software of the Edge 1030 vs 820 vs 520 Plus. See for example the Smartphone Connected Features in the tables above and below. However, these minor differences are usually evened out at some point in software updates. So, they should not be a deal breaker one way or the other when deciding between these units. These 3 bike computers have quite significant differences in size and weight. The Edge 1030 weighs 4.8 oz (123 g), the 820 weighs 2.4 oz (67.7 g), and the 520 Plus weighs 2.2 oz (62.5 g). The 820 and the 520 Plus are identical in size and display resolution: 2.3″ diagonal screens with 200 x 265 pixels high resolution. The Edge 1030 is very noticeably bigger, with a 3.5″ screen, looking more like a smart phone. One way in which the 1030 is superior to the Edge 820, is that the 820 has a substantially smaller screen (the Edge 1030 screen is 1.2″ taller). This means it is easier to see maps on the Edge 1030. This could be important if you have eyesight that is less than perfect. In fact, I find the Garmin Edge 1030 (and the 1000) are the only bike computers I can see without difficulty (with the exception of the much cheaper CatEye Padrone, but that of course is a whole different class of bike computer). However, I am in my fifties, and none of me works quite as well as it did 30 years ago! If you don’t have any vision issues (and if, like me, you basically never cycle for 44 hours straight) the Edge 820 offers a remarkable range of features in a substantially cheaper unit than the Edge 1030. And of course, the Edge 520 Plus offers almost all that the 820 does, for a much cheaper price. Buy the Edge 520 Plus if you want navigation and turn-by-turn directions for most situations, and don’t mind downloading routes beforehand when you are cycling to brand new destinations. As far as training features, the 520 Plus has all that most cyclists could possibly want. But don’t get the Edge 520 Plus if you really enjoy touchscreens. In that case, you might want to choose the Edge 820. Or the Edge 1030, if your eyesight requires the bigger screen of the 1030. Buy the Edge 1030 if training features AND full-feature navigation are important to you (that is, you want to use the unit to input addresses and navigate to them with turn-by-turn directions, without having to think about it the day before), AND your eyes are not that great. Or if you want enormous battery power for very long rides. Or if you ride a lot in the rain, because its touch screen works really well in the rain. Buy the Edge 820 if training features AND full-feature navigation are important to you (that is, you want to use the unit to input addresses and navigate to them with turn-by-turn directions, without having to think about it the day before), AND you can manage to see maps on a smaller unit just fine. It comes down to what you need and value, and how much you are willing and able to pay for it. It’s a tough choice, but somebody’s got to make it! Finally, for those who want every single detail, this chart aims to include all of the key features on these three bike computers. However, they have so many features, it is entirely possible I have missed some. If so, please mention that in the comments, and I will fix it! Lowest Price on Amazon Right Now: Because price is lower than manufacturer's recommended price, we cannot display it. Please click here for current price. $399.99 (Price for bundle with speed and cadence sensors) Because price is lower than manufacturer's recommended price, we cannot display it. Please click here for current price.